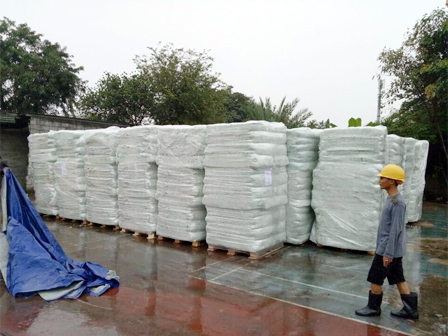 3,000 tons of geotextile as the sand mixture for International Equestrian Park arena have been arrived at Tanjung Priok Port, Monday (5/7). Geotextile is used to maintain moist and concentration on soil when horse jumping on the arena.
" Four containers or 3,000 tons have arrived in this first phase"
PT. Pulo Mas Jaya Director, Bambang Mursalin said, geotextile shipping is done gradually through sea lane. 3,000 tons will be shipped on the first and second phase. "Four containers or 3,000 tons have arrived in this first phase. Its remaining will be arrived on May 20-21," he informed, Tuesday (5/8). He explained, each container could accommodate 750 tons. These geotextiles sent from Germany is temporarily placed on the north side of PT. Pulo Mas Jaya office, Jl. Jenderal Ahmad Yani, Kayu Putih, East Jakarta. Geotextile is used by mixing it with sand. Three-four kilograms of geotextile are usually mixed with every square meters of sand. "With this component, sand can be elastic when the horse step on the sand," he added.